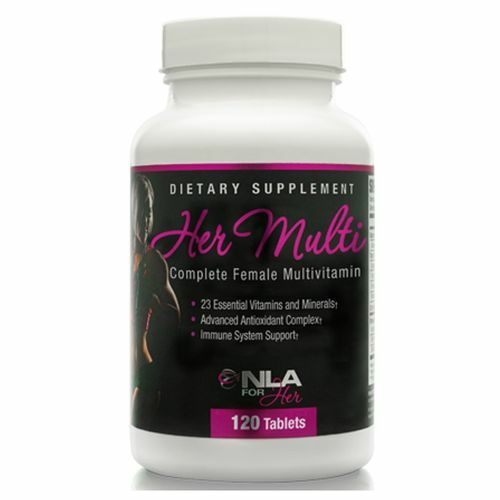 Her Multi from NLA for Her contains a fruit and veggie blend with nutrients derived from ingredients like broccoli, tomato and cranberry. Advertências: Contains soy. This product is only intended for use by healthy adults over 18 years of age. Consult your physician before using this product is you are taking any prescription or over the counter medications or supplements. Do not use this product if you are pregnant, expect to become pregnant or are nursing. Do not use this product if you are at risk or are being treated for any medical condition or if you are taking a MAO inhibitor. Do not exceed recommended serving size or suggested use. Notas: Read all instructions, warnings and ingredients carefully before use. Recomendações de uso: As a dietary supplement for women, consume 2 tables daily with food.